This time of year a goal on almost everyone’s list is to be more organized. I know it is on mine. As a matter of fact I am trying a 52 weeks of organizing type program. So far so good. 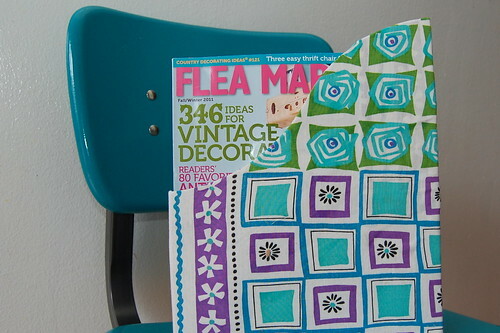 Luckily, I have a few cute craft suggestions to make organizing easy. No kitchen is complete without some sort of message center. 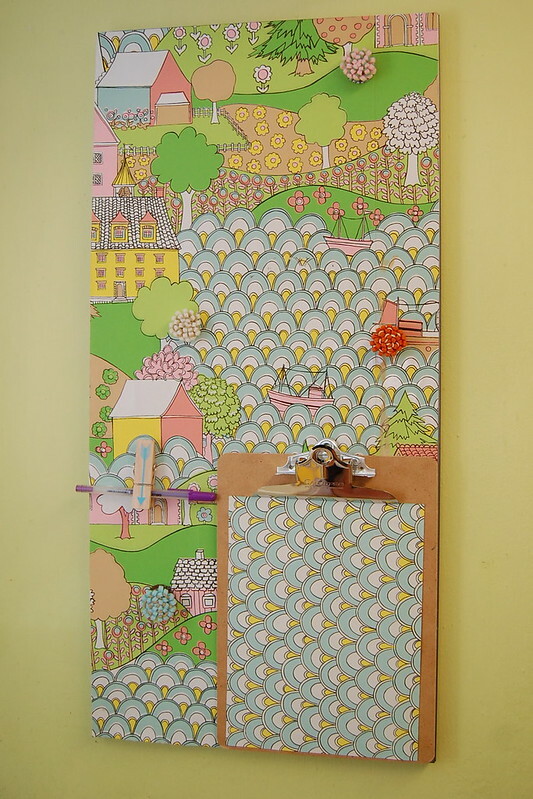 Most families always need somewhere to keep a grocery list, permission slips and what not – why not make it cute. Using a sheet of metal, clipboard and some vintage wallpaper I got my tacky glue on and made a message center that I adore. Now if only I would actually start using it. Since my move I have yet to unpack my jewelry. Shocking I know. Even more shocking is the fact that I have made not one, but two different jewelry displays for I Love to Create through the years. I really have no excuse. 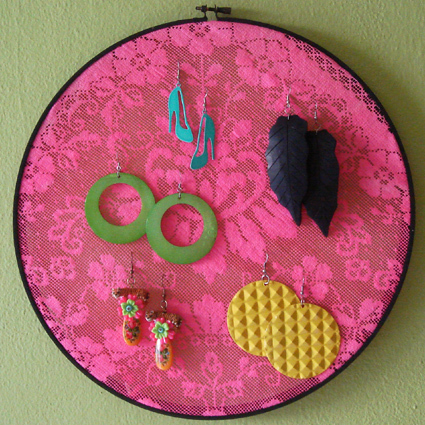 An embroidery hoop makes a great earring holder and a vintage thrift store jewelry box is easily transformed into something special. Now to get everything untangled and organized. As a compulsive picture taker it is important to keep my pictures organized. After my children were born I made a promise to start printing my pictures and putting them albums. In recent years I have been making scrapbooks, but originally a plain old photo album was ok by me. Well maybe not plain. 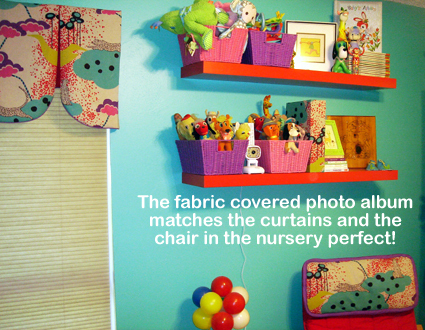 Check out this tutorial on how to cover your own photo album with fabric. I can never find a pen. I know they exist in my house, but just like socks they get sucked into the abyss. 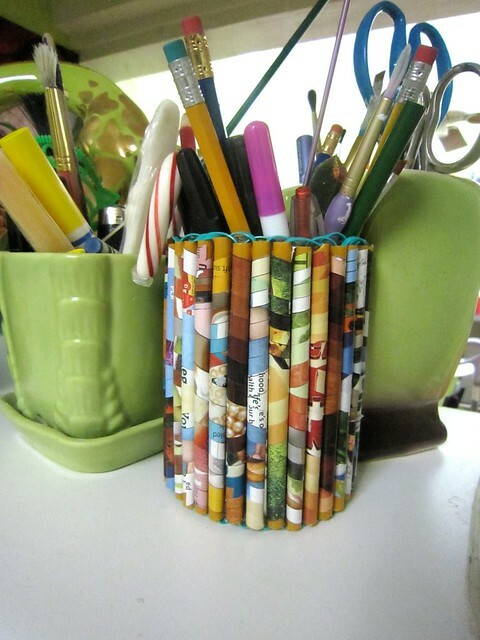 I once had the bright idea to decorate an old tin can and make a cute can corral for my pens. It works great when I buy a brand new pack of pens and put them in there. The problem is I always forget to put said pens back after using them. Some magazines you read and recycled, others (like crafty ones) you keep forever. 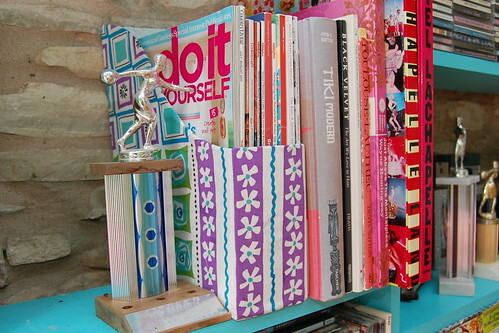 Magazines can get unruly quick to wrangle all those periodicals with a cute fabric covered magazine holder. I made these as a Mother’s Day Gift, but giving the gift of organization (even to yourself) is always welcome. 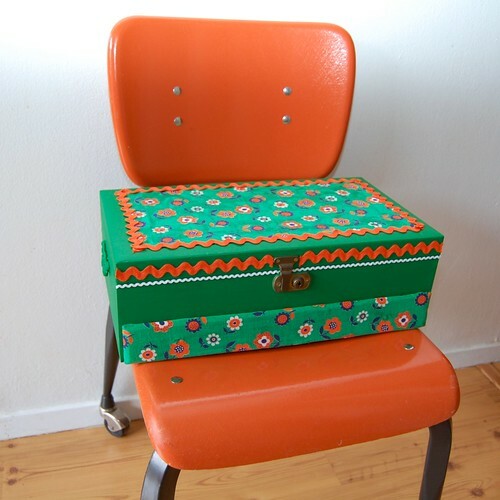 Do you have any crafty ways of getting organized in 2014? I’d love to hear them. Despite intense love for mechanical automatics, your decision replica watches sale should make sense. An automatic movement, indeed, is there in this fake rolex sale. Quartz – how much ever you may argue, it has better chances of staying alive when thrown into its intended purposes. Wearing the replica watches with the strap is what you'll find wonderfully bright! The blue star-burst dial (also, subdials) syncing with the blue bezel speaks of the many years in the rolex replica sale TAG history. To match up, the stagnated range of replica watches technical straps (also for Aquaracer) bore options. The NATO-style strap in blue and white with a replica watches uk bright streak of orange in the middle ended TAG's subdued, monochrome palette.